What a way to start off the New Year!!! 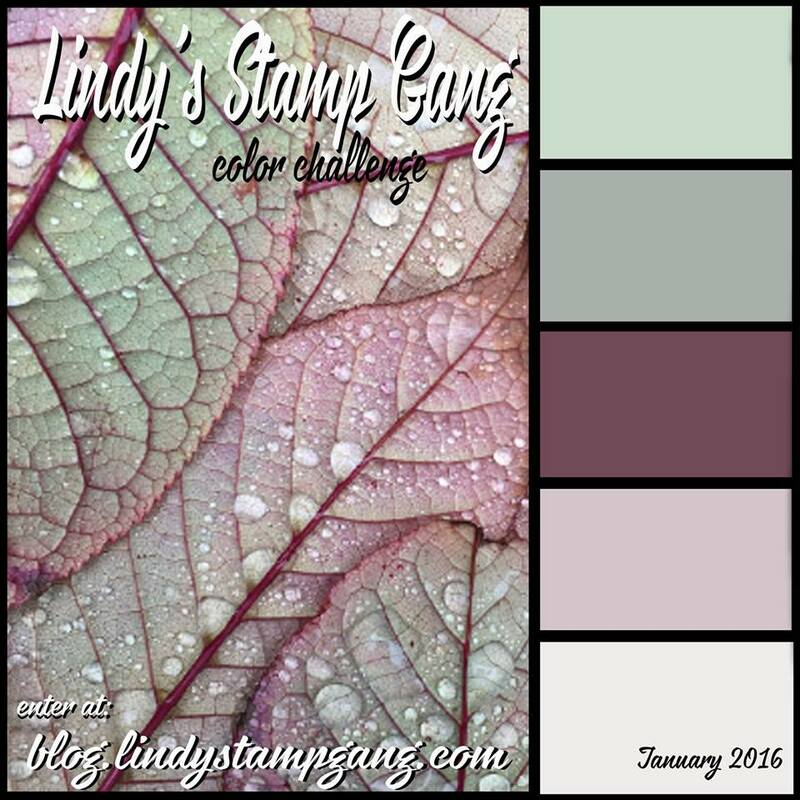 With a gorgeous palette from Lindy’s Stamp Gang for the Color Challenge this month. I have been honored to have been invited to spend another year with Lindy’s Stamp Gang!! There are simply no other color products that compare. Starbursts and Glitz and Moon Shadow mists and Flat Fabios oh my… The Mega Set for this months Color Challenge has it all. Plus the fabulous Embossing powders. Two Toned Embossing powders you say??? Oh yes… Fabulous!! I created a layout using Sizzix die cuts, Dusty Attic Chipboard, Prima and Recollection flowers and Lindy’s Sprays and Magicals of course! The photo features my sisters youngest grandchild. To prepare my surface, I covered a 12×12 piece of corrugated cardboard with patterned paper. I then took 3 pieces of corrugated cardboard, covered them with the same paper and adhered them by layering them on my 12×12 piece. I then painted the whole layout with white gesso. Once it dried I white washed the background using Magicals in mad hatter mint green, sweet violet purple teal and bodacious blush. Then I added some MoonShadow mist in Treasure Island Aqua using a small paint brush. I colored all of my white flowers using the sprays. The blue flowers were sprayed with Mad Hatter Mint Starburst, the purple flowers are Open Arms Amethyst Starburst and the brown aqua flowers are Treasure Island Aqua Moon Shadow Mist. I simply adore the sparkling aqua that comes through and settles down in different spots. The Dusty Attic chipboard title was primed with white gesso, them painted with a heavy mixture of Mad Hatter Mint Green Magicals. Here you can see the dimension of the layers in my layout. The white gesso covered the raw edges of the corrugated cardboard. I sprinkled the layout with a few jewels placed randomly around the page. I also spattered on Treasure Island Aqua Moon Shadow mist. I took a piece of cheese cloth and sprayed it with Treasure Island Aqua Moon Shadow Mist. This gave it a lovely tea stained look with a bit of aqua color. The die cut frames were all primed with white gesso, then sprayed with a combo of Mad hatter Mint Green starburst and treasure island aqua Moon Shadow. The trick is to spray on a non stick craft mat and swirl your pieces into the spray. This gives you full coverage with a mottled look.The middle part of this layout was inspired by a canvas my dear friend Jennifer Snyder and her watercolor canvas she did for Blitsy. The die cut leaves were painted heavily with Magicals in Mad Hatter Mint green and bodacious blush. The butterflies were painted with Sweet violet Purple teal Magicals. I finished them with a flower stamen for the antennae and some jewels for the body. I dipped the tips of the antennae in Sweet Violet Purple teal Magicals. Here is the gorgeous color palette for the January Challenge. I hope you have been inspired to join us this month for the Color Challenge. You will have the chance to win 1 of 5 Gift Certificates to the wonderful Lindy’s Store. With so much to choose from you may want to enter each and every month for a chance to win!! Kick off 2016 in colorful style!! Join the Lindy’s newsletter and be the first to get sneaks, peeks, techniques, and SPECIALS!! You will NOT be disappointed! Lisa your layout is just stunning. Lovely colors .. Your texture is impressing and your flowers and leaves are awesome… Thank you for sharing your beautiful work.